Russia celebrates the 200th anniversary of the Patriotic War of 1812 on Sept. 2, and historians of the period are still trying to separate facts from fiction. 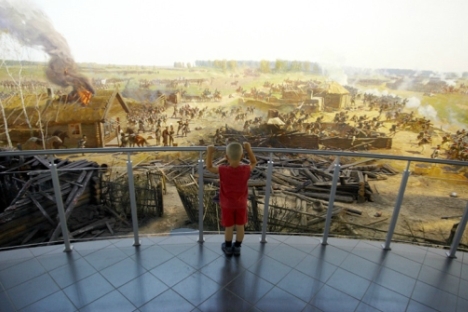 Lidia Ivchenko, director of the Borodino Battle Museum Panorama, spoke to Kirill Reshetnikov of the Vzglyad newspaper about the legends that surround the conflict. Vzglyad: Have any new facts, unexpected findings or alternative versions connected with the War of 1812 appeared recently? Lidia Ivchenko: Perestroika enabled free interpretation of many events, but the key point here is to learn to use this freedom correctly and not to hunt “sensations.” Freedom should not harm scientific credibility. If you are interested in new facts, I wrote a thesis work on the Borodino Battle where I touched upon the issue of the event reconstruction. Based on the sources, I found out that the battle’s timing was somewhat different than previously assumed. Vzglyad: What do you mean specifically? L.I. : According to the documents, the Semenovski fleches were attacked four times, while it was always assumed there were eight attacks. This information could not be disclosed in Soviet times as it was thought to be harmful to the Russian army’s glory. In many cases, documents were adjusted to some versions, and not vice versa. Concerning unexpected versions, there are many of them and some are very amusing. For instance, there is a hypothesis that [Field Marshal Mikhail] Kutuzov surrendered Moscow because he was a Mason and for this reason he prohibited people to come with hayforks to the suburb where Moscow Governor-General Count Feodor Rostopchin was gathering people left in the city to defend Moscow. Vzglyad: The situation you are describing is likely to originate from the Perestroika boom of historical “sensations,” isn’t it? L.I. : No doubt, it is. There is hardly a source that does not state that Kutuzov's fame was created by Stalin. Why are not then the first and second generations of historians who wrote Kutuzov’s biography considered? We all know very well what they were motivated by, and that Comrade Stalin could not possibly pressure them. The 100th anniversary of the War of 1812 was celebrated long before the Soviet ideology appeared, but both then and even earlier Kutuzov had been considered a prominent military commander. Vzglyad: There is a long tradition of interest in Napoleon. Is it true that he had a few especially devoted admirers in Russia in different time periods? L.I. : At least from time to time we do face a typical stereotype: Kutuzov is perceived as a representative of patriarchal aristocracy in Russia, while Napoleon is considered a bearer of new progressive trends. Once again, some tend to believe that during Soviet times Napoleon’s history was silenced on purpose, that we were deprived of the opportunity to evaluate the greatness of his actions. For what it's worth, let's consider what official Soviet historians wrote about Napoleon. For instance, Yevgeny Viktorovich Tarle, who was instructed by Stalin to write a corresponding monograph, created an image of a successful sole ruler, politician and military commander. Long after Tarle’s study, Professor Albert Zakharovich Manfred started writing Napoleon’s biography, under the Politburo's supervision that showed Napoleon as a follower of the French Revolution ideas. Vzglyad: The vision of the War of 1812 millions of people have is based on Leo Tolstoy’s novel War and Peace novel. Don’t they run the risk of perceiving the story as historically accurate? L.I. : Of course, they do. If you want to know the history of the War of 1812, you should read not War and Peace but quite a different kind of literature. But if you want to get an idea of that time and those events, then Tolstoy’s novel suits this purpose perfectly well. As one of our historians noted, Tolstoy created the reality he had the right to create as an artist. It is necessary, however, to distinguish a scientifically credible picture from that created by an artist. And I think an ordinary historical sense is quite capable of it. First published in Russian in the Vzglyad newspaper.